Vada's Blog Stamp Inks and Paper : Color Challenge is Jewel Colors Plus Gold. Gingersnaps new color challenge #92 is “Jewel Colors plus Gold”. Wow have you seen the beautiful art posted so far? If not, please stop in, it will be worth your stop. Beautiful work Ladies, and Thanks Shar for this color challenge. For my card I’m using a forgotten stamp from Club Scrap. Bought it some time ago and it was put in a drawer and forgotten. I colored the spools of thread to match my base colors. The little shears are a die from Provo Craft. I added Gold thread and Gold brads. 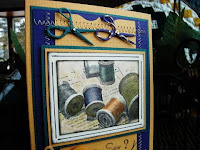 So darling, Love those little sizzors and your spools of colorful thread, Add the stitching and buttons and you have created one terrific card. I really like your design and all the embellishments and stitching make it even better. I made a comment (surprised that I could) but it 'froze' when I tried to provide the spam-preventer. I cannot believe that's a stamp! It looks like a photo! Beautiful card, Vada! Fantastic use of the colors, Vada! Spectacular card! 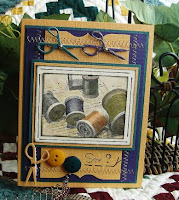 What a wonderful card - love the stamp and the way you've colored it. Love it! Awesome Vada, that image is colored in so good at first I thought it was a photograph! Lovely card for the challenge. Vada, so love your "sewing" card! Those little scissors are the most perfect embellishment! So fun! That's a beautiful collage. Congrats on beeing a Ginger Gem.